Interview conducted by Priscila Barrera; article text by Georgia Williams. 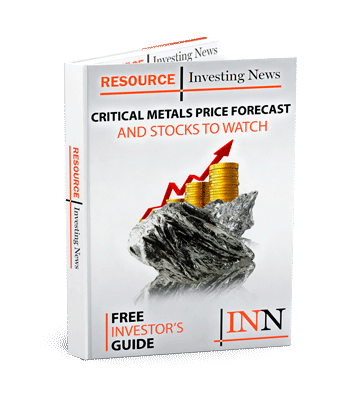 At the 2019 Prospectors & Developers Association of Canada (PDAC) convention held in Toronto, the Investing News Network spoke with Luisa Moreno, managing director of Tahuti Global, to discuss which strategic critical metals investors should watch in 2019. We also asked Moreno about investor sentiment around the current market for battery metals. “I think it’s moderate, [sentiment] it’s still there, but not as strong as two years ago when we saw the prices of lithium stocks and cobalt stocks were very high, now they have been coming down and I think it’s a reflection of the prices of those metals,” she explained. Moreno, who chaired the Energy Materials and Specialty Products presentation at this year’s PDAC, also spoke to the challenges both investors and miners are facing in the changing landscape of project development, and downstream integration. Despite remaining cautious in regard to strategic metal investment, Moreno did indicate that rare earths offer value potential as demand for neodymium magnets grows, especially in relation to the expected surge in electric vehicle manufacturing. “I think the demand will continue to go up, everyone talks about electric vehicles and there is potential for more companies to adopt the permanent magnet motors, those do use neodymium; but you know there is increasing demand for technologies and for mobile technologies and so forth so there will be use in applications for the various rare earths,” said Moreno. However, she did stress the need for production to occur outside of China, where the vast majority of all rare earths output derives from. “The story has not changed, China still is the largest producer the largest processor of rare earth, we have Lynas (ASX:LYC,OTC Pink:LYSDY) in Malaysia they have a percentage of the market, but the processing technology is mostly still in China, they have the technology to produce metals as well as the alloys,” added Moreno. Watch the interview above for more from Moreno on rare earths and battery metals. You can also click here to view our full PDAC 2019 interview playlist on YouTube.